One of the new bastions of Third Avenue, this imposing tower offers spectacular corner bay windows and a full panoply of luxury amenities. 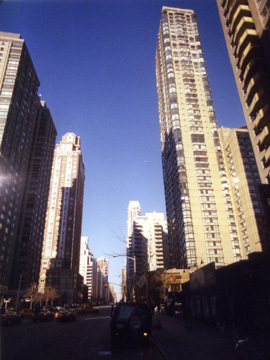 The building was originally called the Milro Tower using the first three letters of the last name of two of the developers, Paul and Seymour Milstein, and the initials of the third developer, the estate of Robert Olnick. 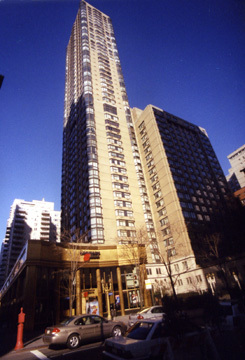 The 50-story tower, which was completed in late 1987, has a midblock, low-rise base whose curved roof houses a large health club and pool. The project, which contains 308 condominium apartments, was designed by Ulrich Franzen & Associates and Philip Birnbaum & Associates. The proportions of the tower are excellent and the dark corner balconies neatly frame its not unattractive composition. 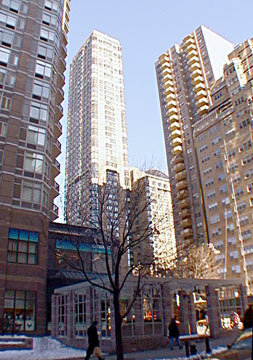 Its location is at the epicenter of the newer Upper East Side. Roof has many telecommunications "dishes"
The roof has an open structure on which many telecommunications "dishes" are supported, a bit like a Easter hat. The cluster of dishes is not neatly arranged, which gives the top a rather dashing, windblown look. The base of the building is rather handsomely unified in bronze-looking metal trim, which has nothing to do stylistically with the rest of the project, but is one of the better looking street frontages along the avenue and there is a large driveway on the sidestreet. The building's lobby is double-height and lined with lacquered dark wood.